Report shows students across the country struggle with food insecurity. The Ole Miss Food Bank is trying to help. The U.S. Government Accountability Office recently released its first report on hunger on college campuses near the end of last year, revealing the expansive problem of food insecurity among college students across the country. University of Mississippi students are no exception, Shane Ferrero, co-director of the Ole Miss Food Bank, said. The food bank is a student-run organization created to fight hunger in the Ole Miss community, and it serves around 50 people per month. Codirector of the Ole Miss Food Bank Shane Ferrero restocks the pantry. Photo by Daniel Payne. The report suggests far more students need assistance, though. Academic studies that were reviewed for the report estimate high levels of food insecurity, which is defined as limited or inconsistent access to adequate food, among university students. The report estimates that anywhere from 9% to over 50% of college students may be food insecure. Of the 31 studies reviewed, 22 estimate a food insecurity rate of over 30%. According to the report, not enough research has been done for the numbers to be generalized. Goldrick-Rab said that the research team learned about the magnitude of the issue by listening to students. After years of research and learning to ask the right questions, she learned that food insecurity affects both lower- and middle-class students, disproportionately affecting veterans, first-generation students, students from foster care and students who are parents. Students who appear to be getting the most financial aid are often the ones who need the most nutritional assistance, she said. The report also found that most students don’t fit the mold of financial dependence. According to the research, 71% of college students are either financially independent from their parents, have one or more dependents, are single caregivers, do not have a traditional high school diploma, delayed college enrollment, are only enrolled part time or are employed full time during the school year. Almost 2 million of these at-risk students were potentially eligible for the Supplemental Nutrition Assistance Program but reported receiving no benefits. Because much of the same information is used to determine SNAP eligibility and financial eligibility through the FAFSA, some universities help students complete both forms at once. Ole Miss does not have a program like this, according to the Office of Financial Aid. 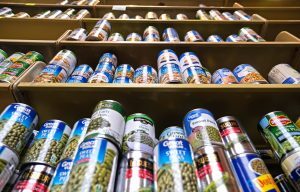 The primary way the university works to solve hunger is through the Ole Miss Food Bank. The food bank serves students, faculty and staff, as well as their immediate families, by providing free, non-perishable food for a few hours every day except Saturday. The main concern of those who run the food bank, though, is reaching students in need. When the food bank began in 2012, it occupied open space on campus in Kinard Hall. Ferrero said that the space has been good to get the bank started, but expanding it or moving it closer to the heart of campus would help make it more convenient for students who are already fighting stigma. Reinhardt said the focus is to “make sure everyone is taken care of and everyone is full so they can focus on their academics.” Getting proper nutrition allows students to perform better academically and improves graduation rates, according to Goldrick-Rab’s research. 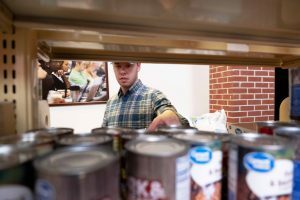 Though food banks help alleviate the problems of hunger on college campuses, many advocates want more efforts to resolve the national problem. “We will never have a way of food-pantrying our way to the end of this problem,” Samuel Chu, national organizer for MAZON: A Jewish Response to Hunger, said. Chu explained that many students do not use all of the meals included in their meal plans, and he suggested that these unused, prepaid credits could be used to feed students without stable food supplies on campus. The idea has been formalized in the organization Swipe Out Hunger, but there is not an Ole Miss chapter. Students in many states, such as Massachusetts, lobbied their university and government leaders to implement changes, according to Goldrick-Rab.